We’ve all done it: Ended a lyrical line with ‘orange’ or ‘silver’ and sat there thinking ‘bugger’. Rhymes do not always come easily. One becomes bottlenecked, which is wincingly galling when so much effort has been expended at the sequencing and tracking stage. Applying lyric content to a song provokes sweat levels similar to those experienced in the performance room of an overly expensive recording studio, so how to break through and give full throat to your poetic message? I’ve taken to Rhyme Genie, an app that has propelled my lyricism to unheard-of heights. And depths. There was an old Windows program monickered A Zillion Kajillion Rhymes that used to do the trick, but Genie is a tad more trick. It totes more than 300,000 entries, some 170,000 phrases and has proper nouns galore (in excess of 35,000), along with more than 48,000 titles of charted songs. So when the appropriate word just will not enter my brains, depleted from reading and absorbing yet another EULA (which nobody actually does, so what’s the point ye software publishers? ), I load Genie and see what it has to say. I could take you through the stuff on offer. In fact, selective impart begins now: Additive rhyme, amphisbaenic (snake-like), apocopated (dropping off the final syllable), assonant, consonant, first-syllable, rich, related, trailing and reverse rhyme - Genie’s got 'em nailed. Sure, it takes a little while to load, probably a result of having been authored in FileMaker Pro, but it’s rather less time than you’d spend scratching your head and delving into learnt vocab for something that will do. Genie has saved me from such monstrosities as rhyming ‘moon in June’, ‘brain, rain & pain’, ‘love & above (or shove)’ as well as ‘party/hearty/farty/naughty’. That last one needs an American accent, really. The important thing is that, with its 115,000 Webster’s Dictionary (shame it’s not the Oxford, but I’m sniffy like that) and thesaurus of more than 2.5 million synonyms, and facility to output monosyllabic or multisyllabic words that either rhyme, weakly rhyme or get freakily fuzzy, Genie’s algorithms rock. I never thought I’d ever end up writing that phrase. Whatever. Silver: Alder, altar, anger, center, conjure, acid boiler – rather a lot. Methylenedioxymethamphetamine: Unsurprisingly, Rhyme Genie didn’t like this one. However, the narcotic's street-name ‘ecstasy’ yields: algae, age-weary, a fine frenzy, amusingly, birthday party, Bump Me Baby - all quite apposite. Not bad for a database, but naturally, it takes the poet in you to make it really do the business. 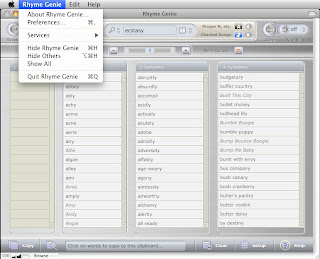 In use, Genie is just like any dictionary or thesaurus app. 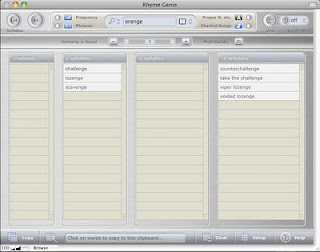 Tap in word and get results, but rhyming results, not definitions or synonyms. 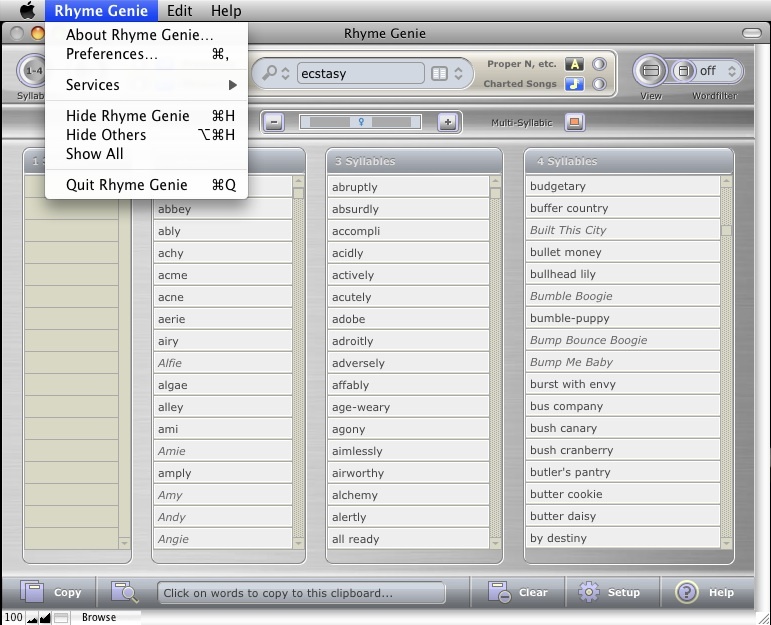 You can define the number of syllables in reported rhymes, how closely they rhyme and explore idiomatic implications. I would mark it down for relative slowness of loading, but compared with head-scratchy time, it’s zippy as funk. There’s even a special songwriters’ dictionary loaded with 600,000 charted song lyrics, so you can tell when you’re inadvertently scabbing someone else’s clichés. At the price, Genie’s pretty fab and, if you’re the type to type your lyrical leanings into a laptop while away from the workstation, an extra licence can be had for a mere $7.95, while the cross-platform Windows XP to 7 or Mac OS X 10.4.1.1+ doobrie is $39.95. If you’re not the soundtrack sort and resort to lyrics, rapping, jingles, or are just a regular logophile or even a sesquepedalian, Rhyme Genie is for you. It works for me. 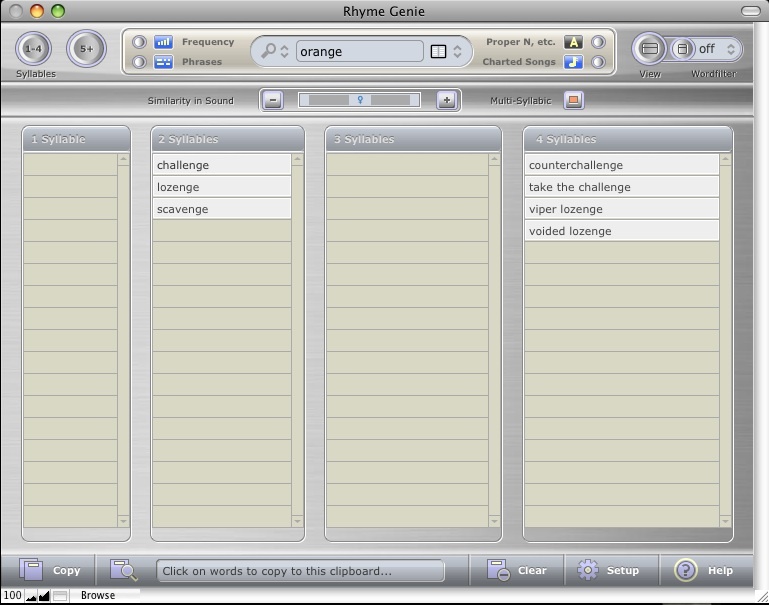 And with that said, let us scurry now to a look at the latest incarnation, Rhyme Genie 2.